Overall Condition Good to fair. Most of our pieces have spent decades on at least two continents, and have been treasured by several owners. Small splits, scrapes and cracks are a normal part of their patina attesting to their age and extensive use. We examine each piece carefully when we receive it and report any damage we find in our listings. Please look carefully at the pictures which may also reveal condition and damage. Damage/Repair Stains, fraying, thin spots, holes. General wear. Additional Information: An extraordinary textile! This was made in the Kuba Kingdom, which is in what is now the Democratic Republic of the Congo, formerly Zaire. Men did the weaving, women did the dying and embroidery. Raffia, which comes from the raffia palm tree, is notoriously difficult to work with. Soaking and pounding were both used to soften the fibers. Each piece took months to make. Matisse was hugely influenced by these textiles, and had a number of them in his bedroom. This is your chance to purchase an original--Matisse made copies! "In sub-Saharan Africa, where representative art has flourished for centuries, carvers and crafts people have typically taken for their subjects human figures, animals, plants, and elements of the natural world. Abstract art, meanwhile, has remained marginal. 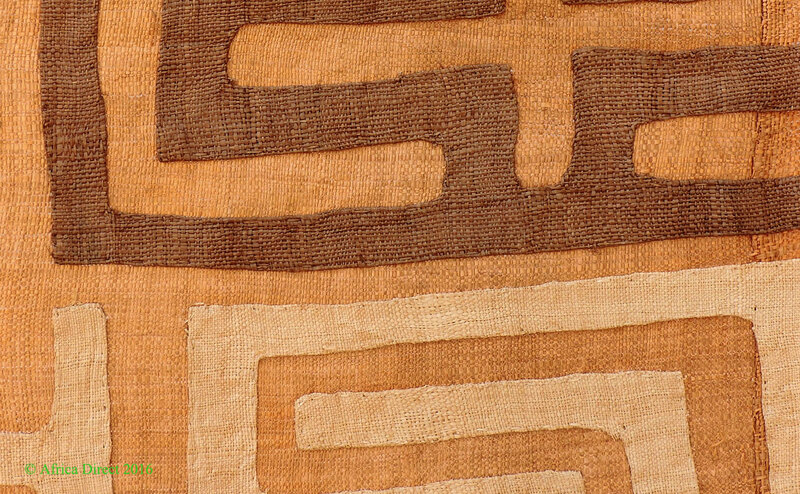 The textiles of the BaKuba (Kuba) people of the Democratic Republic of Congo are an exception. Although part of a tradition that stretches back 400 years, Kuba textiles have a strikingly modern look. They use improvised systems of signs, lines, colors, and textures, often in the form of complex geometric rectilinear patterns. Their appliqués are reminiscent of works by 19th- and 20th-century masters like Matisse, Picasso, Klee, Penck, and Chellida. This is no coincidence: all of those artists were inspired by Kuba design!" 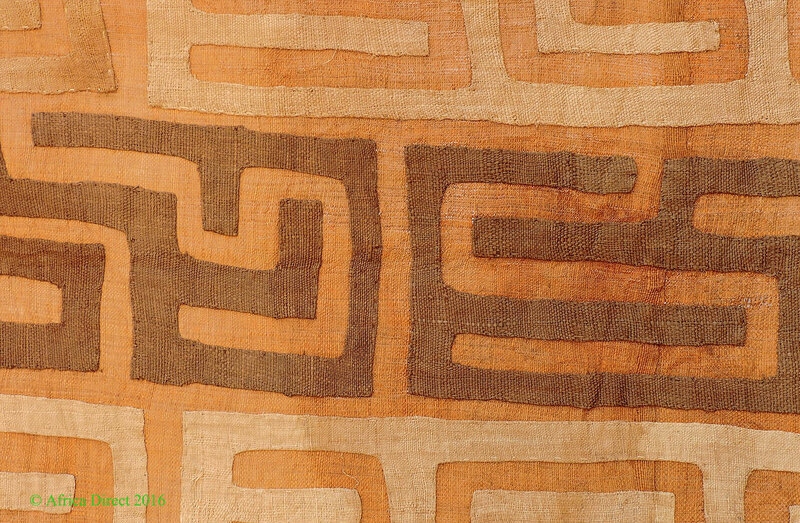 "Appliqué is the most popular weaving technique among the Kuba. To create an appliqué, Kuba artists use a stencil to cut decorative designs out of a brightly colored cloth, and then sew or apply the designs onto a cloth of a different color. The designs are then placed on top of yet another cloth. Through this process, the artist has the freedom to create an almost unlimited variety of patterns and combinations." "The most familiar appliqués are dark brown or black on an ecru background, a pattern which is sometimes seen in reverse. Other popular appliqués are red or yellow, or are placed on a red or yellow background. Appliqués can also be natural-on-natural (or occasionally red-on-red). The black-on-neutral embroidery which resembles an elaborate maze is the work of the Ngeende or Ngoongo." "Many European and American collectors have noted the striking similarities between Kuba appliqués and Matisse’s dancing figures. One surviving photograph shows Matisse in his bedroom, surrounded by Kuba textiles—an indication of how deeply he was influenced by Kuba design." Elizabeth S. Bennett and Niangi Batulukisi Ph.D., Kuba Textiles & Design , AfricaDirect Inc., 2009, 41 pages. 28 full color photographs, paperback.